How do I get Tree Removal Service in Fort Wayne? 1. Same day Tree Service. Nobody can tell when that storm that knocked over that tree in your yard. Or that wind storm that removed all the branches from your trees will hit. If you have a large tree or multiple branches down we can take care of that emergency quickly and efficiently. We check and make sure you do not have any dangerous hazards with down or leaning trees on your property. 2. Professional experienced staff. Our professional tree removal and stump removal team has years of expertise experience in all the types of tree jobs we do. We carry all the licenses and bonded insurance required. 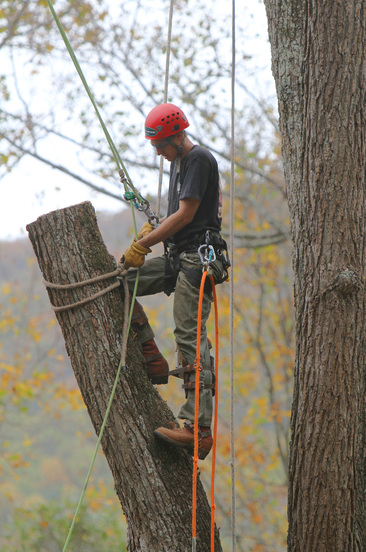 We have the best arborists with the specialize knowledge to take care of your difficult tree issues. We can take care of your trees and shrubbery. We also have tree care packages to keep your trees from needing to be removed in the future. 3. We deliver top service. We listen to what you need and help to provide a custom solutions for you or our customers and offer customized solutions for you needs. You may have over grown trees that need removed. Maybe you need the help with the hedges because you can't get them right. We offer many types of services and will be able to provide you a detailed bid so you know what you are paying for and can expect to receive. 4. Custom Solutions. No two jobs are the same and whether we are removing a tree, or helping to save one. We have the custom tree solutions for your needs. We can provide you the perfect solutions for your issues. Fill out the form or give us a call and we can show you what we would recommend for your Tree Service needs. Quotes will be provided by Phone, so please use actual number. 5. Safety is one of our main priorities. We go to great links to insure our workers and your personal safety. We use all the latest in harness and tree fall prevention techniques to insure we will complete the job without future property damage, and most importantly no people injuries. We also do our best to keep the cats out of the tree. 6. Your Satisfaction is Guaranteed. We are known as the best and when you see us in action you will know why. We are the best at what we do so give a call and well show you why you can trust us with your tree service needs. STUMP GRINDING...Once a tree has been cut down you will then need to decide what to do with the remaining stump. If you decide to just leave it you will have an eye sore left on your property potentially lowering property values for you and your neighbors. A stump will rot on its own if you have the time and desire to wait that long. We can provide the Stump Grinding solutions you need and the price you can afford. TREE PRUNING...There are many reasons to prune a tree in Fort Wayne. It might be for safety reasons to make sure that you are not going to have a tree fall on a house or a power line. Make sure you have dangerous branches removed as soon as you can. You will notice trees especially in the summer will begin to shed leaves to early in the heat if the size of the tree exceeds the amount of water that can be brought into the tree. This would be an obvious signal to have a tree pruned. To help keep a tree healthy you should plan on pruning your tree in the late fall or early winter to prevent tree damage. TREE REMOVAL....Tree removal itself can be a daunting task for someone who is trying to do it yourself. I think we have all heard the stories of someone who tried to do it themselves only to find out the tree landed on car or took out a window and cost thousands in damage. A Professional is definitely the way to go. Give us a call to diagnose your tree issues and see if removal is truly the correct option for you tree. Sometimes the tree gets to big for the space, or maybe you tree needs have changed since the original owners planted it.